The Mollusca , common name of molluscs or mollusks, are a large phylum of invertebrate animals. There are around 100,000 recognized extant species of molluscs. Mollusca is the largest marine phylum, comprising about 23% of all the named marine organisms. Numerous molluscs also live in freshwater and terrestrial habitats. Molluscs are highly diverse, not only in size and in anatomical structure, but also in behavior and in habitat. The phylum is typically divided into nine or ten taxonomic classes, of which two are entirely extinct. Cephalopod molluscs such as squid, cuttlefish and octopus are among the most neurologically advanced of all invertebrates – and either the giant squid or the colossal squid is the largest known invertebrate species. The gastropods (snails and slugs) are by far the most numerous molluscs in terms of classified species, and account for 80% of the total. The phylum Mollusca is one of the three largest phyla of the animal kingdom. It contains about 100,000 living species, so that, in abundance, the molluscs are second only to the Arthropoda. Despite a basic similarity in basic morphology, the molluscs display an almost bewildering diversity of form. They range in size from minute snails only one half a millimeter in length to giant squid over 15m long. They are widespread in aquatic and terrestrial habitats and occupy a wide range of niches. Estimates of accepted described living species of molluscs vary from 50,000 to a maximum of 120,000 species. In 2009 Chapman estimated the number of described living species at 85,000. Haszprunar in 2001 estimated about 93,000 named species, which include 23% of all named marine organisms.Molluscs are second only to arthropods in numbers of living animal species—far behind the arthropods’ 1,113,000 but well ahead of chordates’ 52,000. It has been estimated that there are about 200,000 living species in total, and 70,000 fossil species, although the total number of mollusc species that ever existed, whether or not preserved, must be many times greater than the number alive today. So far 20 land, 22 freshwater and 437 marine and brackish water mollusc species belonging to 21 genera, 105 families and 23 orders under 4 classes have been recorded from Bangladesh. Molluscs have more varied forms than any other animal phylum. They include snails, slugs and other gastropods; clams and other bivalves; squids and other cephalopods; and other lesser-known but similarly distinctive sub-groups. The majority of species still live in the oceans, from the seashores to the abyssal zone, but some form a significant part of the freshwater fauna and the terrestrial ecosystems. Molluscs are extremely diverse in tropical and temperate regions but can be found at all latitudes. About 80% of all known mollusc species are gastropods.Cephalopoda such as squid, cuttlefish and octopus are among the neurologically most advanced of all invertebrates. The giant squid, which until recently had not been observed alive in its adult form, is one of the largest invertebrates. However a recently caught specimen of the colossal squid, 10 metres (33 ft) long and weighing 500 kilograms (1,100 lb), may have overtaken it. Freshwater and terrestrial molluscs appear exceptionally vulnerable to extinction. Estimates of the numbers of non-marine molluscs vary widely, partly because many regions have not been thoroughly surveyed. There is also a shortage of specialists who can identify all the animals in any one area to species. However, in 2004 the IUCN Red List of Threatened Species included nearly 2,000 endangered non-marine molluscs. For comparison, the great majority of mollusc species are marine but only 41 of these appeared on the 2004 Red List. 42% of recorded extinctions since the year 1500 are of molluscs, almost entirely non-marine species. Molluscs have such a varied range of body structures that it is difficult to find defining characteristics that apply to all modern groups. The two most universal features are a mantle with a significant cavity used for breathing and excretion, and the structure of the nervous system. As a result of this wide diversity, many textbooks base their descriptions on a hypothetical “generalized mollusc”. This has a single, “limpet-like” shell on top, which is made of proteins and chitin reinforced with calcium carbonate, and is secreted by a mantle that covers the whole upper surface. The underside of the animal consists of a single muscular “foot”. Although molluscs are coelomates, the coelom is very small, and the main body cavity is a hemocoel through which blood circulates – molluscs’ circulatory systems are mainly open. The “generalized” mollusc’s feeding system consists of a rasping “tongue” called a radula and a complex digestive system in which exuded mucus and microscopic, muscle-powered “hairs” called cilia play various important roles. The “generalized mollusc” has two paired nerve cords, or three in bivalves. The brain, in species that have one, encircles the esophagus. 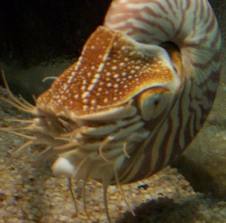 Most molluscs have eyes, and all have sensors that detect chemicals, vibrations and touch. The simplest type of molluscan reproductive system relies on external fertilization, but there are more complex variations. All produce eggs, from which may emerge trochophore larvae, more complex veliger larvae, or miniature adults. A striking feature of molluscs is the use of the same organ for multiple functions. For example: the heart and nephridia (“kidneys”) are important parts of the reproductive system as well as the circulatory and excretory systems; in bivalves, the gills both “breathe” and produce a water current in the mantle cavity, which is important for excretion and reproduction. The molluscs have always been of interest to man . For millennia molluscs have been a source of food for humans, as well as important luxury goods, notably pearls, mother of pearl, Tyrian purple dye, sea silk, and chemical compounds. Their shells have also been used as a form of currency in some pre-industrial societies. Their outlandish forms have helped conjure up tales of mythological sea monsters such as the Kraken. A number of species of molluscs can bite or sting humans, and some have become agricultural pests. The colorful molluscan shells of verities of shapes, size, forms and texture have great aesthetic appeal to human beings of all ages. Various sea-slugs, sea-butterflies, sea hares, several cowries, limpets, murex, turbans, tritons, turret shells, periwinkles, nerites, olive shell, cone shells, clusterwink, slithery octopuses, sheely nautiluses are always at centre of the attraction in all public aquariums. It is man’s inborn nature to collect, whether it be rocks, shells, coins, stamps, cars, or baseball cards. We all collect. We always have. It’s part of being human. We find procuring, sorting, identifying, cataloguing, and trading of items we find dear to us, and quite satisfying. There are almost as many reasons for collecting shells as there people collecting them: many people simply admire the endless beauty and variety of shells (a large collection can have up to 30,000 species! ), while others collect more for scientific reasons – there is still a great deal to learn from and about the shells of the world, and well-documented collections are of great value to science, even today! The collection and study of shells, whether by amateurs or professionals, is called Conchology. Due to their rarity, some cones ( Conus gloriamasis ) are considered as the glory of the sea, aristocrats etc are highly priced by the collectors. Commercial shells are ground, polished, embossed and cut into various sizes and used in the shell-craft industry for preparing many value added products. Sea-shells are used in the preparation of ornaments like shell-based jewelry ( necklace, ring, earrings, brooches, bangles, hair slides, hair pins etc); household articles such as trays, astrays, table, lamps, shades, door hangers, screens, toys, wall hangings, key rings, mother of pearls, buttons, garlands, chains etc. Trochus and Turbo are also commercially important gastropods in making valuable buttons, bangles and mother of pearl. The shell trade involves collection or shell-picking; stocking and transfer, and use in small industries by the user agencies. Several gastropods and bivalves are farmed and harvested commercially for different purposes. Abalone farming is form of mariculture that includes culture of any small to very large edible sea snails, marine gastropod mollusks in the family Haliotidae. Pearl Culture is a practice in which oysters are farmed for the purpose of developing pearls i.e. highly valued as gemstones and objects of beauty and is a hard object produced within the soft tissue (specifically the mantle) of a living bivalve mollusks. Oysters farmed for acquiring pearls belong only to family Pteriidae. Oyster farming is an aquaculture (or mariculture) practice in which edible oysters are raised for human consumption. Commonly farmed food oysters include the Eastern oyster Crassostrea virginica, the Pacific oyster Crassostrea gigas, Belon oyster Ostrea edulis, the Sydney rock oyster Saccostrea glomerata, and the Southern mud oyster Ostrea angasi. Shells like cowies have a long history of being used as currency (the money cowry, Cypraea moneta), and the gold-ringed cowries (Cypraes annulus ) in many parts of the world notably in Asia, Central Africa, the islands of the Indian Ocean and countries surrounding the Bay of Bengal. Molluscs are important as human food, poultry and shrimp feed and edible lime (also lime as building material). A wide variety of molluscs like snails, mussels, cockles, oysters, clams, cuttlefishes, squids and octopuses are considered a delicacy all over the world, particularly in the Indo-pacific region, Europe and the Americas. Snails (Abalones) are a special delicacy to the French. However, snails are also an important item in the diet of frogs, lizards, birds and many mammals. Shells have played a central role in religion from prehistoric times on. Dominating early religious practices, cowry shells (Cypraea) had powerful symbolism (basically sexual, for they were first and foremost a female symbol) and this was renewed in the religions of the great civilizations that followed. The presence of shells in prehistoric burial places indicate that their symbolic power was believed to continue beyond life. Shells in some cultures even today are used as amulets, good luck charms, and as symbols for love, fertility and life eternal. Africa: Shells fetishes were often used in worship. Ceremonial garbs are many times decorated with shells and were used in some religious ceremonies. Note: a “fetish” an object which is treated with reverence and respect because it is either thought to have special powers, or is where a god or spirit lives or is present in some special manner). North American Indians also made fetishes of shells. The Canadian Ojibwa tribe maintained a Grand Medicine Society in which the sacred emblem was a shell. India: Hindus: The god Vishnu holds his staff crowned with a very rare left-handed Turbinella (“Chank“) shell. The Hindu, when praying, often clasps a sacred chank or other venerated object in his hands, believing that it will help his or her petitions be heard. Priests also use it for holding sacred oils. Buddhists: The Chank or Turbinella also plays a significant role in their ritual music and ceremonies, and figures into Buddhist iconography. The home of the shrine of Santiago(St. James). St. James’s badge is the Giant European scallop shell (Pecten jacobaeus Linne). Pilgrims to this shrine purchased the simple but exquisitely sculptured scallop shells and wore them as a sign of their pilgrimage to the shrine. This scallop also appears in many paintings and statues of this saint throughout Europe. Egypt, China and other cultures used the cowry in connection with their burials and other religious ceremonies. Sierra Leone: Cannibals during the nineteenth century used cowry shells in part of their ceremonial rituals. Pre-Columbian South and Central America: Archaeological sites have produced shell trumpets that may have played a role in religious ceremonies. In the Andes region, a Thorny Oyster (Spondylus princeps (Broderip)), and the giant E. Pacific conch (Strombus galeatus Linne) as well as Pinctada atlanticus (a Winged Oyster) all had important religious significance. The Aztecs of Mexico also used shells in their religion: Tlaloc, the rain god, is depicted as emerging from a conch (Strombus spp) shell. They also used conch and horse conch (Pleuroploca) shell trumpets. Minoan Crete: Shell trumpets were used in religious ceremonies. Many churches had or still have baptismal fonts made of Tridacna gigas Linne) (the famous “Giant Clam”!) or are designed in their likeness. They are thought to be a symbol of birth. Long before our modern day communication systems, man found that trumpets made from shells produced a sound that carried for many miles. By using as series of trumpet blasts, messengers were able to communicate fairly detailed messages from village to village, tribe to tribe. In many countries shells have also been tied together or had such things as sand or beads sealed inside them so that they became as sort of rattle to accompany song and dance. as a daily call to prayers. Shinto priests in Japan still use the Triton Trumpet shell (Charonia tritonis L.) for this today. as summons to call warriors to battle and to ring out triumphs in battle. as a prelude, or to call people to public gatherings, such as tribal or community meetings, feasts, sporting events, etc. as a curfew announcement – and is still used in Samoa today, as a signal to proclaim the return of a sailing vessel from a voyage or fishing trip. as a foghornin the Mediterranean. as an accompanimentin songs, chants and dance throughout the Indo Pacific. as a ritual – blowing of the Triton trumpet (Charonia tritonis Linne) at sundown is still customary in Hawaii today. So, shells of Horned helmet (Cassis cornuta ), Triton’s Trumpet (Charonia tritonis Linne), Queen conch (Strombus gigas Linne), King helmet (Cassis tuberosa ), Giant Frog shell (Bursa bubo)Indian and West Pacific Oceans. Giant stromb or conch (Strombus galeatus) – Central America are greatly used in music . Molluscs are also used in the preparation in Ayurvedic and homeopathic medicines in the form of extracts of oyster shell, cowry shell and operculum of Pugilina. Shell amulets were once thought to ward off ill health, infertility or bad luck. Shells have also been ground up for use in potions and for various medicinal uses throughout history. Today the shell, its living flesh and by products are being studied and used in many areas of medicine. An extract from the hard clam or “Quahog” (Mercenaria mercenaria L.) is a strong growth inhibitor of cancers in mice. It is called mercenine, after the clam’s scientific name. Ground and processed oyster shells are used as a calcium supplements both for humans and animals. Paolin, a drug made from abalone juice, is an effective inhibitor of penicillin- resistant strains of bacteria, such as Staphylococcus aureus, Streptococcus pyogenes, Salmonella typhus and parathyphoid A & B bacteria. Oyster juice has been found to have anti-viral properties, and may be made into a drug eventually. The threads that some mussels (Mytilidae) use to attach themselves to rocks, piers, and other hard surfaces are being tested as possible glue in surgery. The cement of the Carrier Shells (Xenophoridae) is being studied for use as a possible cement for bone fractures. Note: The Carrier shells are the camouflage experts of the mollusc world: they attach all kinds of objects – shells, rocks, pieces of coral, sponges, bottle caps. to their shells, so they look like a little pile of trash on the bottom of the sea – a great way to avoid being eaten! Powdered mother of pearl is sold in the markets of the Peruvian Andes to promote healing of wounds (unproven). Traditional medicine in Vietnam has a wide variety of uses for shells: powdered oyster shell is taken to treat acid indigestion, fatigue and to stop hemorrhage. It is also sprinkled over open wounds and boils. Cuttlefish bones are used as a remedy for rickets, a healing agent in the treatment of gastro-intestinal troubles, a local anti-hemorrhagic (i.e., it stops internal bleeding), and as an antiseptic is cases of inflammation of the middle ear. The flat shell of the Abalone, with its iridescent inside, is powdered and taken orally to improve vision, to remove keratoses (cataracts), and to improve such conditions as hemeralopia (where one can see at night well, but hardly at all in the daytime. Powdered pearls from oysters are used as a topical eye medicine (i.e., it is put it right on eyes), and it has been scientifically proven to have some anti-inflammatory effects on a painful condition called conjunctivitis, where the surface of the eye becomes red and sore. Molluscs, particularly the bivalves, are bioaccumulator of heavy metals and other pollutants from water. Now a days, they are widely used bioindicators, to monitor the environmental health status of the habitat they occupy. For example, by analyzing the viscera of the widely distributed bivalve, Corbicula collected from different locations of the Ganges-Padma river running from Nepal through India and Bangladesh to the Bay of Bengal, the status particularly of heavy metal contamination levels of different locations can be evaluated. The hard and limy fossils of the molluscs are chronological time clocks to determine geological time . Through their fossils, petro-geologists are also able to locate oil deposits below the earth surface. In ecosystems, a wide range of molluscan species work as scavengers. Some nerites, moon snails, bladder snails, chitons, limpets, Hinia, geoduck clam work as scavengers. Not all molluscs are beneficial. Some are destructive; for example, the burrowing shipworm (Teredo) which damages wooden ships, boats, ships and logs. The borers ( shipworms) and foulers like mytilids anf epifaunal forms like oysters and anomids are also found on the Bangladesh coast, and these are a nuisance. Snails, land slugs are pest, damaging gardens, agriculture and vegetation. African giant snail (Acatina fulica) are dangerous agricultural pest. Various molluscs often serve as intermediate for parasitis helminthes causing disease cattles and human. Acatina fulica has been reported as intermediate host of human lungworm. The spread of parasitic eggs of Salmonella by snails and slug is associated with fresh vegetables. Siddiqui, K.U., Islam, M.A., Kabir, S.M.H., Ahmed, M., Ahmed, A.T.A., Rahman, A.K.A., Haque, E.U., Ahmed, Z.U., Begum, Z.N.T., Hassan, M.A., Khondker, M. and Rahman, M.M. (eds.). 2007. Encyclopedia of Flora and Fauna of Bangladesh, Vol.17. Molluscs. Asiatic Society of Bangladesh, Dhaka 415 pp.